During the Holocaust, a large group of Polish women were rounded up to be sent to the gas chambers. As the group gathered their possessions to take with them into the camp the evil Nazi officers called out to all the villagers who were standing by watching, "Anything that these Jews leave behind you may take for yourselves, because for sure they will not be coming back to collect them!" Two Polish women who were standing nearby saw a woman towards the back of the group, wearing a large, heavy, expensive coat. Not wanting to wait to see if others got the coat before them, they ran to the woman and knocked her to the ground, grabbing her coat and walked away. As the Jewish women were being led away, these two Polish women lay down the coat to divide the spoils of what was hiding inside. As they rummaged through the pockets, they discovered gold jewellery, silver candlesticks and other heirlooms, but still, as they lifted the coat it seemed heavier than it should be. After further inspection they found a secret pocket, and hidden inside the coat was a little baby girl. Shocked at their discovery, one of the women insisted to the other, saying "I don't have any children, and I'm too old to have now. You take all the gold and silver and let me take the baby". The deal was agreed and the Polish woman took her new 'daughter' home to her delighted husband . They raised the Jewish girl as their own, treating her very well, but never told her anything of her history. The girl excelled in her studies and became a successful paediatrician, working in the top hospital in Poland. After some years the girl's 'mother' passed away. A week after, she received a knock at the door. An old woman invited herself in and said "I want you to know that the woman that passed away last week was not your real mother..." and she proceeded to tell her the whole story. The girl did not believe her at first but the old woman said to her "When we found you, you were wearing a beautiful gold pendant with strange writing on it which must be Hebrew, I am sure that your mother kept the necklace, go and look" and with that parting advice she left. The girl went into her 'mother's' jewellery box and found the necklace just as the woman described. She had it extended and wore it every day, but thought nothing more of her Jewish roots. Sometime later, she went on holiday abroad and saw two Lubavitch boys. Seizing the opportunity she told them entire story and showed them the necklace. The boys confirmed that a Jewish name was inscribed on the necklace but did not know what to say about her status. They recommended that she send a letter to the Lubavitch Rebbe explaining everything. She sent off the letter and received a speedy reply saying that it is clear from the facts that she is a Jewish girl and since she had a special talent, she should use her invaluable skills in Israel, a place in desperate need of talented paediatricians. 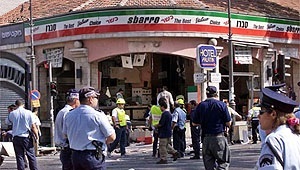 When there was a terrorist attack at the Sbarro cafe in the centre of Jerusalem in August 2001, this woman was walking nearby with her husband. She told her husband to return home to the kids and she proceeded to rush to the scene where she treated the wounded and helped the injured to hospital. When she arrived at the hospital she met an elderly man who was in a state of shock. He was searching everywhere for his granddaughter who had become separated from him. She calmed him down and went with him to search amongst all the patients in order to find his granddaughter. Asking how she could recognise her, the frantic grandfather gave a rough description of a gold pendant necklace that she was wearing. After searching amongst the injured, they finally found the granddaughter who was wearing the necklace. At the sight of this necklace, the paediatrician froze. She turned to the old man and said "where did you buy this necklace from?" "You can't buy such a necklace" he responded, "I am a goldsmith and I made this necklace. Actually I made two identical ones for each of my daughters. This is my granddaughter from one of them, and my other daughter did not survive the war"